What is the meaning of the Buddhist symbol? Right View, Right Motives, Right Speech, Right Action, Right Means of Livelihood, Right Effort, Right Mindfulness, Right Concentration. 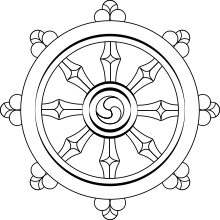 This symbol is called “Dhammacakka” or the Wheel of Dhamma and has been adopted as the seal of the World Fellowship of Buddhists.